Adobo Chronicles, as what their own description says, is the best source of unbelievable news. They are know for making news articles of mixed lies and facts. According to their new format, the sentences in Italic form are facts and those who are in regular font are lies. 1. Does the blog observe proper use of English or Filipino? Yes. Although this blog is known for humorous articles and sometimes playful, this blog still uses proper English and Filipino. 2. Is there name-calling, mudslinging, unverified information as blog entries? Yep. As said awhile ago, this blog contains articles that are based on facts and lies. Therefore, not all pieces of information you read on this blog are true. For example, the article about the United States not requiring VISA to enter their country. The news became so viral that it reached the US embassy. The US embassy then corrected the article that it is not true. 3. Does is depend on “blog content providers” like unscientific surveys, tests or even unreliable sources? We cannot say that Adobo Chronicles are based on unreliable sources because their articles depends on reality. I mean, they write an article about an issue that is already existing. Some of their statements in their articles are just lies therefore the answer to the question is yes, but not all. 4. Does it follow the principles of Truth-telling, Justice, Humaneness and Stewardship? In my own opinion, when it comes to truth-telling, it’s a no. But for stewardship and humanity, this blog supports projects. They donate to charity and all in all, they have helped many charities already. According to them, they have already donated $14,947.92 to the victims of natural calamities and disasters. Moreover, they also have mini-grants to non-profit organizations. 5. Does it adhere to the three ethical commands (Seek truth, Act independently, Minimize harm)? 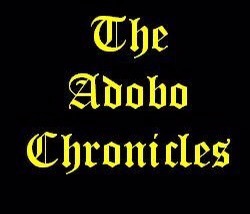 Adobo Chronicles are known for unbelievable stories. They may be acting independently but they are not always telling the truth. What’s happening to journalism today?